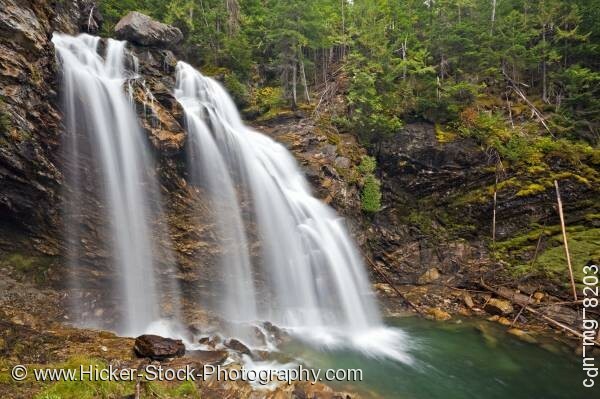 Stock photo of Rainbow Falls in Monashee Provincial Park, Okanagan, British Columbia, Canada. Rainbow Falls in Monashee Provincial Park, Okanagan, British Columbia, Canada. This stock photo shows the misty Rainbow Falls in Monashee Provincial Park, Okanagan, British Columbia, Canada. The misty Rainbow Falls cascade over the embankment in the Monashee Provincial Park. Stacked rocks sit at the top of the rocky embankment with its crevices and jagged edges that separate the flow of the falls cascading waters. The Rainbow Falls looks milky white as the water falls rush into the blue green river below. Just in the background of the falls the rugged embankment continues with the lush green forest of the provincial park. The forest is densely covered with its heavy foliage. Along the river’s wet rocky edge are small patches of green grass and broken tree branches scattered along the shore.